Today I decided to go back and take a look at FreedomPop to FreedomPop calls and texts. 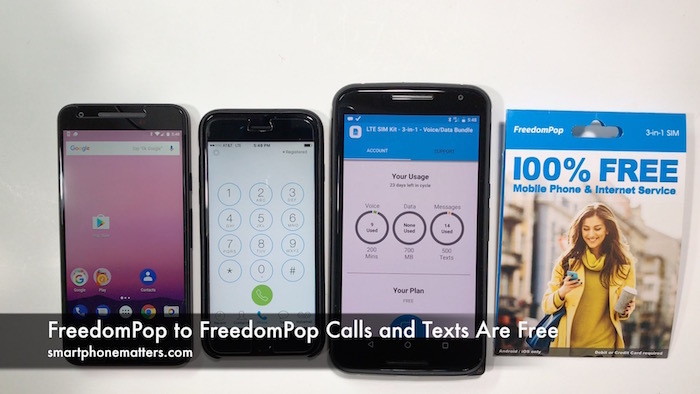 When I first signed up for FreedomPop, I noticed that freedompop.com listed free unlimited FreedomPop to FreedomPop calls and text messages. This sounds like a really cool feature and I wanted to test it out. I set up three phones. First a Nexus 5x using Google Project Fi. This phone has regular phone service. Second, an iPhone 6s and third a Nexus 6. Both the iPhone 6s and Nexus 6 are both using FreedomPop’s free Basic 200 LTE plans. I decided to call and text the Nexus 6 from both the Nexus 5x and the iPhone 6s.I used the MyFreedomPop app on the Nexus 6 to see if voice minutes and text messages were subtracted from my balance. I send a text from the regular phone, the Nexus 5x to the Nexus 6. When I checked the usage stats on the Nexus 6, it had used up a text message. I also placed a two minute call from the Nexus 5x to the Nexus 6 and it did use up two minutes of voice on the Nexus 6′ account. Now, I also did the same thing from the iPhone 6s which is using FreedomPop. But this time, I was not charged for the 2 minute call and text message to the Nexus 6. So it appears that FreedomPop to FreedomPop calls and texts are really free. Finally, I wanted to point out that FreedomPop uses your cellular data or Wi-Fi internet connection for calls and texts. That is why you need to use the FreedomPop app. In my video you’ll see that all the calls and texts did not use any of my cellular data. This is really cool because it means that FreedomPop to FreedomPop calls that use cellular data and not counted against your data balance. So what about you? Are you using FreedomPop? Leave a reply below and share.